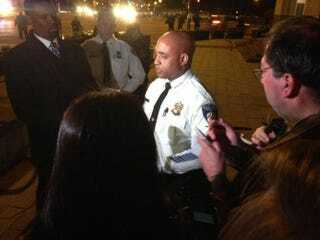 Baltimore Police Commissioner Anthony Batts speaks to reporters. Twelve people were arrested late Saturday after peaceful protests in Baltimore against police violence erupted in anger as demonstrators, officers and fans who turned out for an Orioles baseball game clashed in the streets, CNN reports. Baltimore Police Commissioner Anthony Batts said that the arrests came after a clash between demonstrators, officers and Orioles fans near the Camden Yards baseball park, nearly six hours into peaceful protests against the death of Freddie Gray. More than 100 officers made arrests as some protesters shouted "Killers!" "You can't get away with this!" and "Hands up don't shoot!" reports the Baltimore Sun. Some protesters threw rocks and water bottles at police mounted on horses, smashed the windows of businesses and looted at least two convenience stores, the report says. At one intersection, police chanted, "Move back. Move back," according to the Sun. Tensions in the city have been running high since 25-year-old Gray died a week ago after his spinal cord was mysteriously broken while he was in police custody after an arrest on April 12. Gray’s death has sparked protests similar to those in the #BlackLivesMatter movement that broke out last summer after the death of Eric Garner in New York City and Michael Brown in Ferguson, Mo. Both men were black and unarmed. Gray's twin sister, Fredericka, made a statement Saturday calling for the violence to stop: "My family wants to say, 'Can y'all please, please stop the violence? Freddie Gray would not want this.' Freddie's father and mother do not want any violence. Violence does not get justice," CNN says. Mayor Stephanie Rawlings-Blake said that she was profoundly disappointed by the violence, adding that 95 percent of the protesters were respectful but a "small group of agitators intervened," according to the cable news outlet. On Friday, Batts told reporters that Gray should have received medical care at the site of his arrest. Instead he was made to wait as the police van stopped three times, once to pick up another prisoner, on its way to the station, where officers then called for an ambulance, which transported him to a hospital. Grays funeral and burial are set to take place on Monday in North Baltimore, reports the Baltimore Sun. Read more at CNN and the Baltimore Sun.